Watching Angels is a month-long, interactive public art show based on two simple questions: What if you really could see angels? What if, when you spotted an angel, it had a message just for you? The show will place more than a hundred artist-created angels throughout the town of Brattleboro, Vt. in interesting and quirky locations. When you come upon an angel, it will have an uplifting message just for you! 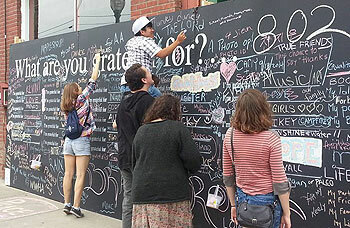 We also have two large chalkboard Gratitude Walls, one at 47 Flat Street (see below) and the other in the Harmony Place parking lot. The walls ask, "What are you grateful for?" and invite people to write out their gratitudes. Join us in the River Garden during September's Gallery Walk to make an angel for the show. 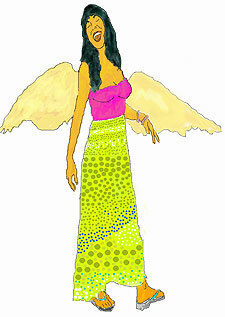 We provide all the supplies -- you only have to bring an idea for an angel and your creative spirit. Submission guidelines for the show explicitly prohibit the use of any advertising, religious art, sexual content, negative imagery or anything conveying political partisanship. Our intent is to be an uplifting, positive, and inspiring show in the way that the angels among us remind us of the best of ourselves. For further information, visit http://watchingangelsartshow.com.